Superhuman strength, speed, durability, and longevity. The story begins with Dr. Donald Blake taking a vacation in Norway. During his trip he witnesses an advanced ship from the planet Saturn, the first scout ship in a planned invasion of Earth. Dr. Blake observes the aliens but steps on a twig alerting the aliens (Kronans) to his presence, forcing him to run to the hills where the lame doctor loses his cane. Blake then moves into a cave where a secret door opens revealing a walking stick. Blake finds himself trapped in the cave by a boulder; Blake attempts to move the impediment with his new walking stick but fails. In his anger, he hits the boulder with his new walking stick which transforms it into a hammer and him into Thor, the Norse God of Thunder. Thor now learns of his new powers granted him by Mjolnir, his hammer. He can create storms and the hammer will always come back to him when he throws it. Meanwhile the Kronans have shown up on Earth’s radar screens, and fighter planes are sent to attack the would be invaders. The Kronans project the image of large dragon scaring away the fighters. Ground forces fare no better, as their ordinance explodes harmlessly before the Kronan’s powerful shielding. Thor enters the fray and the Kronans throw a cage on him, which Thor tears apart. Disintegration beams are blasted at Thor, but Mjolnir smashes the guns. The Mechno-Monster is sent to do battle with the god of thunder, but is smashed to bits by the prince of Asgard. The Kronans are forced to return to their vessels and make a hasty retreat from their failed invasion. Thor changes back to Dr. Blake and the soldiers assembled to battle the Kronans simply ignore the lame doctor. Note: In the movie Thor Ragnarok, the character Korg looks very similar to the Kronans from Thor’s first appearance. Kirby, J., Lee, S., Lieber, L., et al. (2015): Marvel Masterworks: The Might Thor (Vol. 1) (2nd ed.) New York: Marvel. Such an intresting information. 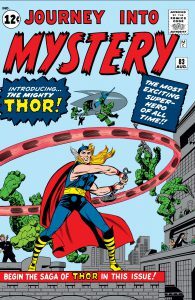 Just like Batman was first appeared in “Detective Comics”, Thor was first appeared in “Journey into Mystery”. I would like to read this comic book of 1962.